Everyday, I have a 45 minute commute (each way) to my current work client. Previously, I was using a multitude of podcasts to deal with the daily grind. However, I recently moved away from just podcasts to audiobooks thanks to the deal for 2 free audiobooks from Audible.com (courtesy of TWIT). I was introduced to audiobooks first through the Harry Potter novels (I highly recommend listening to Jim Dale as a narrator) and then most recently enjoyed Catch-22. For those who have not tried audiobooks, it is very different from reading a book yourself. I see it more as reverting back to a little kid as someone else (who’s better skilled at doing so) reads you a story. It really becomes all about the quality of the story as well as the way the reader reads the story (Are their voices for various characters? Is the voice pleasant to hear? Does the voice not sound like your own? [See Seinfeld episode]). Before Daemon, the list of authors I enjoyed was narrowed to simply Michael Crichton and Chuck Palahniuk. However, after hearing Daemon being recommended multiple times by Leo Laporte and friends, I decided to finally break down and give it a try. Upon finishing the book, I’m extremely glad that I did. 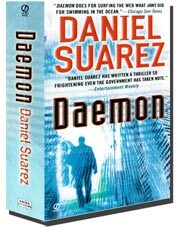 Daemon tells the story of a former computer game programmer / super genius who builds a daemon process that begins killing people in brutal, automated fashion. As more is uncovered about the daemon, it is discovered that there is more to this daemon than just the killings of “innocent” people. When the professional reviews state that this is one of the best techo-thrillers, they really are not kidding. I was on the edge of my seat throughout the book thanks to Suarez’s intense writing and Jeff Gurner’s wonderful narration. There were many times where I was yelling at my radio just like you might when watching a movie alone when you see what is coming for doomed characters. I was so enthralled by the book that I instantly ordered the follow-up (see below) immediately after finishing the book. Don’t continue any further if you are fearful of any possible spoilers. Freedom picks up a few months following Daemon. The Daemon is now completely integrated into the entire internet and has built a large population of followers. Many are still trying to destroy the Daemon but are their true motives justified and valid? Those that are followers of the Daemon are a mixed bag themselves as they work to prove that the Daemon is something the world doesn’t need to stop by use to make a better world. As a potential apocalypse of the internet and financial system is on the horizon, can the Daemon’s followers fight to survive and show the world what good the system is capable of doing? While I did enjoy Freedom, it was not at the same high level and grade as Daemon, but it was pretty close. 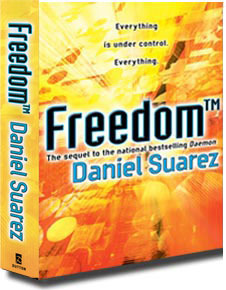 The main interest I had in Freedom was the technology that Suarez so brilliantly described. As Crichton often used truth in science to drive his books, so does Suarez. The technology he describes is possible and seems only a few years away. I am eagerly waiting that day as Suarez’s HUD glasses made me easily want to drop $2,000+ if they were at my local Best Buy today. I also really enjoyed the way in which Suarez provided one of my favorite characters the ability to return from the previous novel. I don’t want to say too much so as not to spoil anything but the manner in which this character returned was very well suited. Now that I am hooked on audiobooks, I’ve already moved on to my next selection, The Girl With The Dragon Tattoo, so that I can better prepare myself for watching the Swedish and American movie versions of this book. What will I listen to after that? Maybe Crichton’s final book, Pirate Latitudes. Maybe Age of Spiritual Machines: When Computers Exceed Human Intelligence by Ray Kurzweil (see Our Lady Peace reference). Anyone have any other suggestions for this particular picky reader/listener? I’ve read through all of the Stieg Larsson trilogy. They’re solid time eaters but, really, in the end, nothing great. It’s definitely a step above Dan Brown’s drivel.